Top Chef alum Chaz Brown believes that chicken wings are the perfect medium for exposing non-adventurous eaters to unusual flavors—mostly because no one will ever turn down a chicken wing. The menu at his new New York City wing spot Seoul Chicken spotlights ingredients ranging from kalamansi (a lesser known citrus) to bottarga (cured fish roe). But let's face it, seasoning comes second to texture, since no one wants a flabby wing. That’s why for the 400 wings he produces daily, Brown uses a technique that guarantees the crispiest skin ever. And the trick is to let them spend a night in the freezer. He revealed more about the technique during a visit to the Food & Wine Test Kitchen. Brine or marinate the wings as you normally would before frying. Then, instead of jacking up the temperature of the oil, just heat it to 225 degrees. Poach the wings for 6 to 8 minutes. This will almost cook them through. Let them cool, then put them in the freezer overnight. Freezing them actually breaks the walls of the cells in the skin and draws the moisture to the outside. 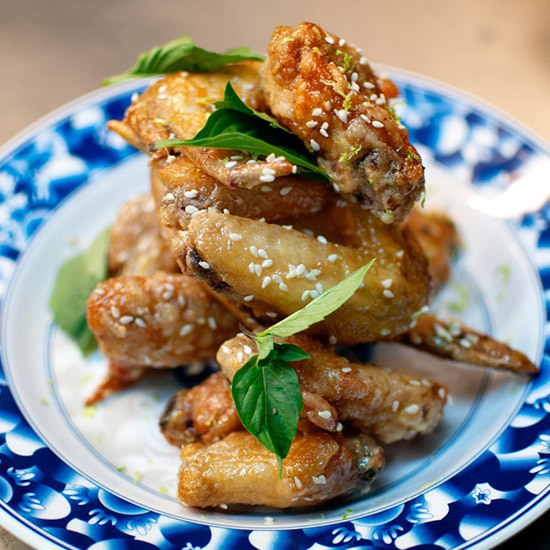 The next day, you will have the driest possible wings, which leads to the crispiest skin. After you’ve thawed them out, dredge them as you normally would, but heat the oil to 375 degrees—a little hotter than normal frying temperature. Remember you don’t actually need to cook the wings again, you just need to crisp them. Fry until golden brown and then crunch away. We love all the wings we’ve had from Brown, but we're partial to his gochujang buffalo sauce. Here’s the recipe so you can try it at home. Add the melted butter in an appropriately sized pot over medium heat until sizzling. Add the tomato paste and toast for 1 minute, stirring constantly. Add the balsamic vinegar and cook for 1 minute. Add the sriracha chili sauce and the gochujang and mix well. Raise the heat to medium high, and bring to a simmer, stirring frequently. Once simmering, remove from heat and season with the salt and honey. Adjust the salt and honey to taste.